Planet Hunters have just made another important contribution to our understanding of planets beyond the solar system! The paper entitled “PLANET HUNTERS. VIII. CHARACTERIZATION OF 41 LONG-PERIOD EXOPLANET CANDIDATES FROM KEPLER ARCHIVAL DATA” has been accepted for publication by the Astrophysical Journal. A preview paper can be found at the astro-ph archive: http://arxiv.org/abs/1512.02559. This work is made possible by many diligent and creative citizen scientists who are acknowledged on http://www.planethunters.org/#/acknowledgements. The census of exoplanets is incomplete for orbital distances larger than 1 AU. 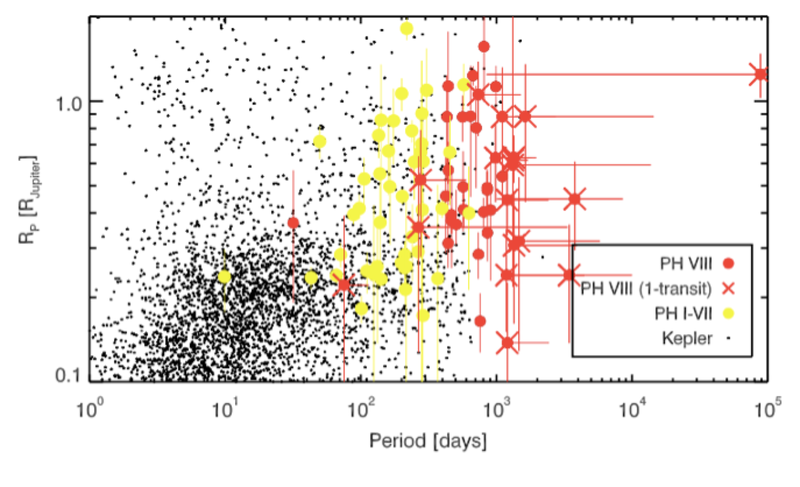 In this new work, we present 41 long-period planet candidates in 38 systems identified by Planet Hunters based on Kepler archival data (Q0-Q17). Among them, 17 exhibit only one transit, 14 have two visible transits and 10 have more than three visible transits. The majority of the planet candidates in this work (75%) have orbital periods that correspond to distances of 1-3 AU from their host stars. In comparison, Earth and Mars are located at 1 and 1.5 AU, respectively. With the help of hundreds of thousands of eyes of planet hunters, we are starting to probe exoplanets at Mars distance and beyond. The majority of these new planet candidates have 1-2 visible transits during Kepler’s 4.5 years’ life time and were therefore not prioritized by the automatic Kepler planet search pipeline, which requires at least 3 visible transits. These discoveries from the Planet Hunters project are complementary to the discoveries by the Kepler mission that focuses on planets located in and interior to the habitable zones of stars. The following figure best illustrates this point. The yellow points are previous PH detections and the red points are discoveries from the latest paper. We are pushing the limit for long-period planets that can be detected by the transit method! We conducted follow-up imaging and spectroscopic observations to validate and characterize planet host stars. These observations took place at some of the world’s biggest optical telescopes, including the two Keck 10-m telescopes on the summit of Mauna Kea in Hawaii, the 200-inch Hale telescope at the Palomar observatory, and a fully-robotic adaptive optics instrument, Robo-AO. In total, we obtained adaptive optics images for 33 stars to search for possible blending sources. We obtain high-resolution spectra for 6 stars to determine their physical properties. Thanks to these follow-up observations, 7 planet candidates have been validated including 3 planets with just a single transit (KIC-3558849c, KIC-5951458b, and KIC-8540376d), 3 planets with two transits (KIC-8540376c, KIC-9663113c, and KIC- 10525077b), and 1 planet with 4 transits (KIC-5437945c). We now have more than 260,000 users and have analyzed more than 20,000,000 30-day light curves. The focus of the Planet Hunters now includes the K2 mission, and we expect that citizen scientists will find many more exciting and unexpected discoveries with the K2 data. At least long-period planets create a lot of data points per transit. I wonder if Earth-sized long period planets leave a visible transit light curve. Who knows. Maybe a lot of systems are much more spread out than our Solar System and only have Mercury-sized planets. Can these Planet Hunters’ findings help to refine automatic transit detection programs? These are all great questions. An earth-size long period planet would be very hard to see. I worry that the smoothing or processing of the data could further diminish this nearly invisible signals. It would be so great to see the planet architectures at wider separations! The automated programs are flagging these signals, but the false positive rate is so high that they currently require a few transits. The Kepler database still has a lot of great discoveries waiting to be made! So how long would it take to get validated planets into confirmed exoplanet list?